The product I am talking about is, of course, the Practilite 602. It’s a fresnel light, meaning it’s a continuous light with adjustable beam width. 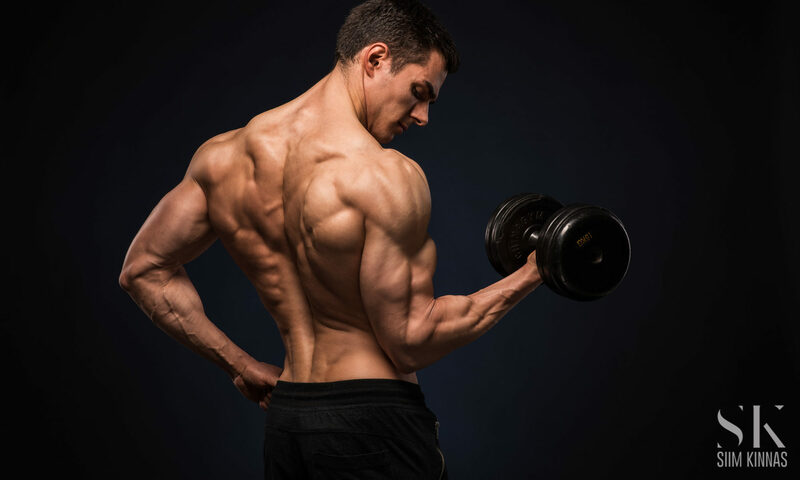 This helps you to keep control over what its light is hitting and how hard. It’s based on a very high-end LED light source that unlike its larger counterparts in the movie business doesn’t get hot. Like, ever. All the while providing as much light as industry standard incandescent lights. Also, you can tune the temperature of the light from a toasty 3000 K to a searing 6000 K? Isn’t that nice? Enough of the hype. Let me tell you what it’s really like. I’d like to stress, though, that whereas this is a product geared more toward video production, I am a photographer with minimal contact to the video world so far. Therefore, my review of this product shall be extremely biased toward the still imaging side of things. The set I was given came in a handy Pelican-like roller case that neatly contained three lights and their power blocks. Taking them out of the case they feel solid as a full metal body item should. They are made of anodized aluminium (or aluminum, however the case may be) which means that a) they look the business and b) they are made to be used and can take a beating. There really is no need to baby them in my experience. The Fresnel lens is in front, as it should be, and the focusing knob is in the back. In an interesting move, Kinotehnik have made not the lens but the light source inside the housing move for the focusing action. This actually helps in the sturdyness department, methinks, as there are fewer moving things that you can apply force to from the outside. 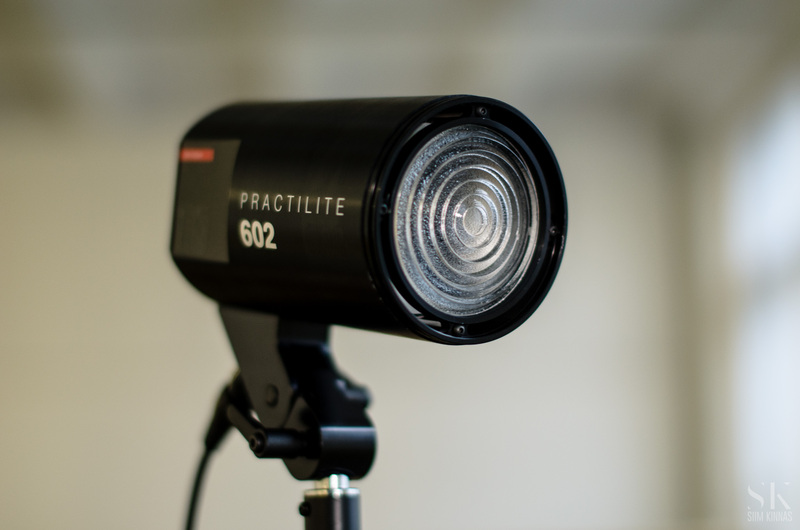 The Practilite 602 has an anodized aluminium body that houses a Fresnel lens and the LED light source. On the side, the Practilites have two turning knobs (for light intensity and colour temperature, respectively) and two buttons (the power button and the “SafeBoost” button”). The knobs felt smooth and offered just the right amount of resistance when turning. The buttons felt reassuring, as well, when pressed. On the back end of the light, in the middle of the air intake that covers the über-silent fan, you’ll find the focusing knob. This moves the light source within the body in reference to the Fresnel lens (that’s pronounced freh-nell, by the way). This in turn causes the light beam to become tighter or wider. The silence of the fan becomes an faintly audible whirr when the light is put into boost mode and should be no problem for the sound guys out there, when filming. The buttons and knobs feel reassuringly smooth without any wiggle in them. Notice also the nice little screen with output and color temperature indicators and the focusing knob in the back. The devices get their power from a universal plug that can have its other end in either a plug-in power source or in any V-mount or Anton Bauer battery pack. Though I didn’t test this myself, I’ve been told that they can go for hours off of a single charge when run off batteries. The lights’ body is actually built to take any light modifier that has a Profoto speed ring attachment (see the photo above). So if you already own some Profoto equipment (as you might do if you’re thinking about a light that costs a bit less than €1000) you can use those right away. Also, you could just spend the €10 and get an adaptor speed ring. It doesn’t have an umbrella mount, though, which is a bummer for me as a photographer but probably not a deal breaker for the video guys out there. I’ve been told that this is because the throw on a Fresnel lens isn’t wide enough to fill the umbrella at that distance. Using the Practilite is really simple – you plug it in, turn it on and it just starts putting out light. Mind you, as a continuous light it’s nowhere near as powerful as a flash would be, so be prepared to raise your ISO by several stops from the base level, if you’re shooting stills. Then again, this is a great opportunity to use that f/1.4 to get that creamy bokeh on a perfectly lit scene. For the steampunk shoot we were shooting indoors and the ambient light was coming from windows facing north, so to balance the colour temperature I tuned the Practilite 602 to around 5200 K at first. Later, for the closeups I went for the warmer temps, to make the skin look more healthy and pleasing. It’s really nice to be able to do that without having to mess with gels and whatnot. You could easily two-tone a lighting setup with the Practilite, with separate tones for the object and the background. One example of the lighting set-ups used. Notice the workaround for the missing umbrella holder? The leading image from the shoot. Two-light solution for the lighting. Whereas with the fantasy shoot, I used the Practilites basically to change the quality of the existing light, the product shoot was a tougher nut to crack. 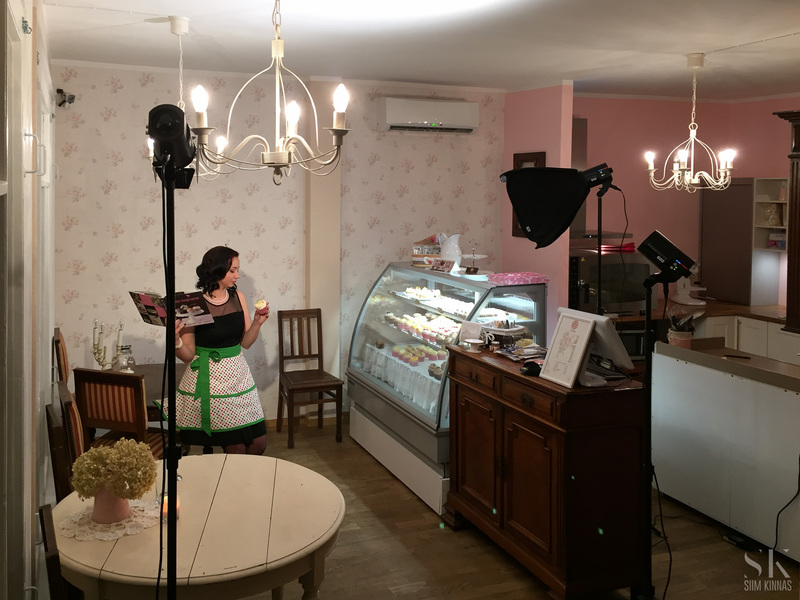 We would be shooting in the evening, inside a small dimly lit cupcake café so the little lights would have to do all the heavy lifting. To complicate matters further, we had a mix of lighting sources, from incandescent in the ceiling to fluorescent from the cake display. Here’s where the little lights that could really shined – we turned the lights’ colour temperature to 2500 for the shots inside the café and tuned them when necessary, moving around the room. Because the point was to emulate the light that was already there, I bounced some of the light off the ceiling, to bring the ambient light up and used one of them to shape the light a bit, to give the model dimension. A third, hard light was used to enhance detail of the aprons. One light in “turbo mode” into the ceiling, an unmodified light aimed at the model to bring out texture of the garments and a softbox to provide dimensionality for the model. To bring in enough ambient light, I had to drop my shutter speed, even at ISO 400, down to 1/60th of a second. Even then, the relative weakness of the Practilites’ output when comparing to strobes meant I was shooting at f/2.8 whereas I would have preferred at least f/4. I wasn’t that worried about shake in my images as I was using the Tamron 24-70 f/2.8 with internal stabilisation. I could, of course, have raised my ISO to 1600 and gone with f/4 and 1/125th (just in case), but really didn’t want to lose the detail in the aprons’ due to the resulting noise. So be warned, there are caveats to working with continuous lights. Anyway, this is where I messed up a bit – I forgot to take a colour reference image. Which means, I had a hell of a time to colour correct the images to at least resemble the actual situation. This is by no means the fault of the lights but rather the incompetence of the user – even though I matched the colour temperature to the other sources in the room quite nicely, the overall colour cast from the pink walls made things tricky. So be warned – using colour reference cards, ColorCheckers etc is strongly recommended. A few words about the SafeBoost mode. In this mode, the light source is boosted to 150% of the nominal power value. Although this sounds scary, it’s actually not that straining to the source – the fan turns a little faster and the housing becomes slightly warmer to the touch. The only downside to using it is that you lose control over the colour temperature – it is fixed at around 4500 K. But, just in case, SafeBoost is disabled while running off batteries. …because they really bring out the colours of the eyes. 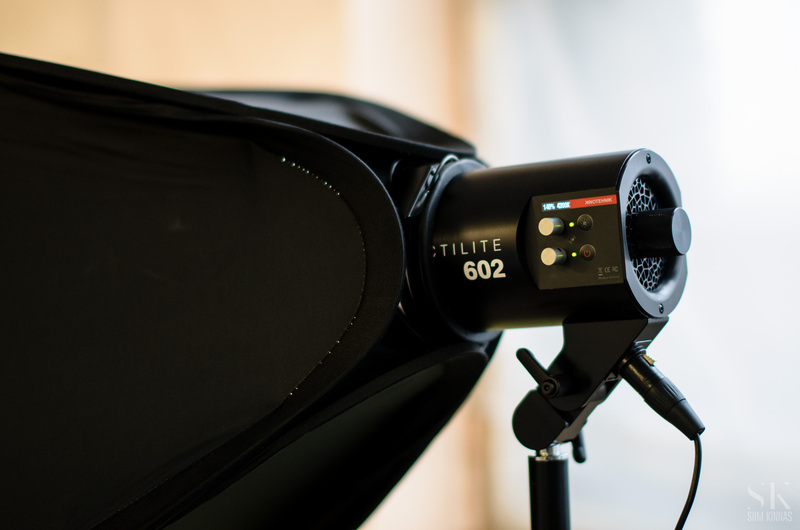 Overall, I highly recommend the Practilite 602 for video and constant-light photo-productions. They offer serious value and are built to last. I just wish they were a bit cheaper. But ain’t that true for just about any piece of photographic equipment? You can check them out and get yours here: www.kinotehnik.com/6873 or at B&H.